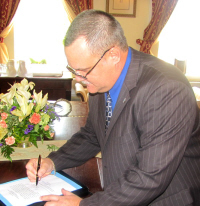 Police Commissioner Rodney F. Querrard Sr. was officially sworn in as head of the Virgin Islands Police Department Monday in a ceremony at Government House. Amid a small crowd of family, VIPD personnel and Government House staff, Querrard thanked Gov. John deJongh Jr. for the opportunity to serve. “Retirement was nice but I was more than appreciative to be called back,” Querrard said after being sworn in by Judge Ive A. Swan. In 2012, Querrard had retired from the position of St. Thomas/St. John chief of police, which he had held for five years as the culmination of 25 years in the VIPD. 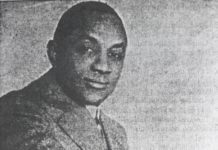 On Jan. 22 he was appointed assistant commissioner and immediately named acting commissioner following the resignation of Commissioner Henry White. His nomination as police commissioner was confirmed June 28 by the V.I. Legislature. Querrard thanked his family for supporting him, knowing the job entails weekly overnight trips to St. Croix and long nights in the office. In brief remarks, Querrard was effusive in thanking his immediate family, his wife, Catherine, and sons Rodney and Ryan, as well as his extended family. “Thank you for standing by me,” he said. He also thanked the leadership and staff of the VIPD for their dedication to duty. In remarks preceding the swearing-in, Gov. John deJongh Jr. praised Querrard for his decision to return to active service to lead the V.I. Police Department. “For me, Rodney epitomizes a true public servant," deJongh said. "While I had to call him repeatedly in 2007 to accept the position of chief of police, this time around, the decision came easy. Before concluding his remarks, Querrard commented on crime in the territory. “What is going on now is uncalled for,” he said. He thanked the citizens for their continued support and urged them to report all crimes and come forward with any information they may have. Querrard is a native Virgin Islander and a 26-year veteran of the Virgin Islands Police Department. As police commissioner, he is responsible for leading a department of both sworn and civilian personnel in both island districts. During his career, he held various positions within the department. Following his graduation from the Police Academy in 1987, Querrard worked as a patrol officer at the Richard N. Callwood Command, Bassanio David Command and Mariel C. Newton Command. He was promoted to the rank of police sergeant in 1991. While serving as a patrol officer, he was assigned to various details including plainclothes assignments to address specific challenges at his assigned commands. As a police sergeant, he supervised officers on both St. Thomas and St. John. This supervisory position also required his providing weekly and monthly reports as well as reviewing officer’s reports and disciplining officers. While holding the rank of police sergeant, Querrard was deputized and reassigned to a joint federal/local drug enforcement unit. At DEA/HIDTA, he served as a Task Force officer from January 1999 through June 2007, when deJongh selected him as chief of police. During eight years as a Task Force officer, Querrard worked on drug-related investigations and most major investigations pertaining to transportation and distribution of large amounts of illegal narcotics, in particular, cocaine and marijuana. In 2001, he was promoted to the rank of police lieutenant and supervised all officers assigned to the joint task force. He also had oversight of the officers assigned to DEA/HIDTA task force on St. Croix. Querrard is a 1982 graduate of Charlotte Amalie High School.